As defined in the NHS/ISTEA/TEA-21 legislation, the 51-mile long Northern Beltline corridor will begin at the interchange joining I-59/20 with I-459 southwest of Bessemer. The proposed route will then arc northeasterly, crossing I-22/U.S. 78, Interstate 65, U.S. 31, Alabama 79, and Alabama 75 before curving back southeast toward Interstate 59 in the vicinity of Trussville near Exit 143. Interstate 422 is a part of High Priority Corridor 28 – Birmingham Northern Beltline (ARC Corridor X-1) from Bessemer to Trussville via Graysville and Gardendale. The entire Northern Beltline will also be designated as Alabama State Route 959. A subsequent feasibility study focused on a potential extension of the Northern Beltline south from Trussville to Interstate 20 near Moody. 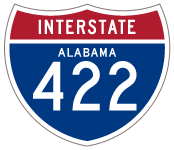 ALDOT simultaneously petitioned AASHTO for designating the Birmingham Northern Beltline as I-422 and the “I-22 Connector” as Interstate 222 on September 27, 2011. The AASHTO Special Committee on US Route Numbering (SCOH) approved both applications on May 18, 2012. I-222 is proposed as a 2.26-mile link between I-422 at Brookside and I-22 in east Graysville. “Corridor X/ I-65 interchange construction could begin this year.” Birmingham News, May 26, 2009. “Northern Beltline construction scheduled to begin Monday.” The Birmingham News, February 19, 2014. “Re: Birmingham Northern Beltline (I-422, I-222).” Online posting, AARoads Forum, May 8, 2012. Page updated March 15, 2014.